Aristides is now on hiatus indefinitely due to members moving, so i made Fam 017 in order to celebrate their existence. 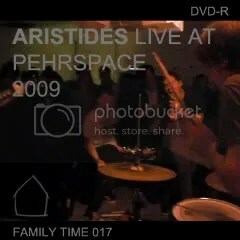 It contains three songs, videotaped at one of their shows pehrspace in 2009. One of the songs is a Joy Division cover and it is all amazing. I decided to make this the day of their last show so the packaging isn’t that nice, but i’m selling the last few that i didn’t give away for the people who couldn’t be at their last show. I posted all of the videos on my Vimeo so if your cheap i don’t hate you. I am selling it for $3.50 US PPD and $4.50 World PPD.